Cups / Filters / Strainers. 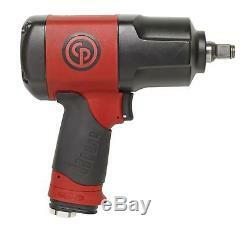 Chicago Pneumatic CP7748 1/2 Composite Impact Wrench. The new Chicago Pneumatic CP7748 is a durable & powerful &###xBD; impact wrench in the entry level composite range. It's an affordable tool yet very reliable for tire shops, general maintenance on vehicles and light industrial maintenance. 1/2 composite impact wrench with ring retainer. Lbs (1,250Nm) of maximum torque in reverse. Aluminum clutch & rear housing. Thermo-plastic rubber injected in housing for a durable and comfortable grip. Universal & durable twin hammer mechanism. Full teasing ergonomically developed trigger. Maximize work efficiency thanks to extreme torque. Insulated and comfortable grip with rubber injected composite housing. Box dimensions:&###xA0;215 x 210 x 77. Over carton:&###xA0;455 x 420 x 240. Working Torque Range (fwd):&###xA0;102-786 Nm /&###xA0;75-580 ft. Maximum Torque (reverse):&###xA0;1250 Nm /&###xA0;920 ft. Free speed:&###xA0;8200 rpm. Blows per minute:&###xA0;1200. Net weight:&###xA0;2 kg /&###xA0;4.4 lb. Power/weight ratio:&###xA0;625 Nm/kg /&###xA0;209.1 ft. Length:&###xA0;195 mm /&###xA0;7.6. Average air consumption:&###xA0;2.5 L/s /&###xA0;5.2 cfm. Actual air consumption:&###xA0;10 L/s /&###xA0;21 cfm. Air inlet thread size:&###xA0;1/4 in. Hose size:&###xA0;10 mm /&###xA0;3/8. Noise level:&###xA0;93 db(A). Sound Power:&###xA0;104 db(A). Vibration &###x3B1; (ISO-28927-2):&###xA0;7.4 m/s&##xB2. Vibration K (ISO-28927-2):&###xA0;2.2 m/s&##xB2. Socket retainer:&###xA0;Friction ring. Clutch type:&###xA0;Twin Hammer. You can also find more product details and spares on the Sprayguns Direct website. All our items now come with&##xA0. The service included in this offer varies depending on the item however you do have the option to upgrade to a faster service if required. Your item leaves us immediately. &###xA0; UK and surrounding British Isles (not Eire/Irish Republic) for (maybe longer for remote islands). &###xA0;UK and surrounding British Isles not Eire/Irish Republic. May be longer for remote islands. &###xA0;(average figure provided by postal service). We also often use UPS for EU locations where we state post, this is because it is a better service but cannot be offered to all areas due to UPS imposing "remote area surcharges" on some locations. &###xA0;The further from the UK you are, the longer the wait. Sprayguns Direct was first conceived in 2002 as we recognised the advantage of specialising in this complicated area of the market. The emphasis on online sales, backed up with specialist staff, helps us provide you with all the information you need to find exactly what you are looking for. We have since expanded in to all supplies for the bodyshop or paint shop and are authorised UK distributors for DeVilbiss, Sata, Iwata, Graco, 3M, Sealey, Standox, Dupont and more. Is a division of Morleys of Derby Ltd.
A family business, established in 1966 and is run by the founder; David Clarke with the assistance of his three sons. The company also has a large support of specialist staff including ex sprayers who have been trained by DeVilbiss and Sata. You will be supplied with a V.
As products are sourced direct from the manufacturers, then you also have access to their technical services. The emphasis on the website simplifies identification and eliminates communication breakdown. With carrier services as they are in the modern market we realised that we could service most customers on a national level quicker than their local distributor and without extra cost. SpraygunsDirect is a division of Morleys Derby Limited, which was established in 1966 and is run by the founder, David Clarke with the assistance of his three sons and a large support staff. Within the company there are three ex sprayers, two of whom have been trained by DeVilbiss and Sata. These factors give the assurance of reliable back up to SpraygunsDirect. Verification increases the overall security of your shopping experience and ensures you are using the most up to date online security when paying online. You don't have to worry about fraud, company bankruptcy or card details being robbed. You also don't have to keep entering your card details in on multiple sites. It is also very easy to set up - it's a no-brainer! UK and surrounding British Isles (not Eire/Irish Republic) for (maybe longer for remote islands). (average figure provided by postal service). The further from the UK you are, the longer the wait. They are generally, though very reliable and predictable. &###xA0; This does not affect your statutory rights. &###xA0; Please note: All our products are checked at various stages during manufacturing. &###xA0; The content of this website is provided free of charge for information purposes only. SpraygunsDirect endeavours to ensure that the information presented on the site is both true and accurate. However, SpraygunsDirect, its agents and its employees will not be held responsible or liable for any errors, omissions or inaccuracies occurring within this content. &###xA0; In these conditions &###xEC;the company&###xEE; shall mean SpraygunsDirect and &###xEC;you shall mean the person, organisation, or company placing an order with the company. &###xA0; ALL RIGHTS ARE RESERVED. Any other use of materials on this website including reproduction for the purpose other than those noted above, modification, distribution, transmission, broadcasting republication, downloading or uploading without the prior written permission of SpraygunsDirect is strictly prohibited. &###xA0; Orders placed by you will not be binding on the company or deemed accepted unless & until written acknowledgement is issued by the company. &###xA0; Any typographical, clerical error or omission in any sales literature, quotation, price list or literature issued by the company shall be subject to correction without any liability on the part of the company. Every effort will be made by the company to deliver the goods within the period specified by the company; however, such dates will not constitute part of the contract. If you are unable to return the goods, you must make the goods available for collection upon request and within 14 days of your notice to cancel your order. &###xA0; The company will not be liable for any costs incurred in the return of cancelled orders. You are advised to retain the original packaging in the event of you cancelling an order. The company retains the right to charge for any necessary packaging/re-packaging. &###xA0; Please note: All our Products are checked at various stages during manufacturing. SpraygunsDirect reserves the right to change price and availability information without notice. &###xA0; SpraygunsDirect shall not be liable to any person for any loss or damage that may arise from the use of any of the information contained in any of the materials on this web site. &###xA0; SpraygunsDirect shall not be liable for economic or financial loss or any special, indirect or consequential loss or damage whatsoever and howsoever arising. We reserve the right to amend rates on your agreement or cancel orders if agreement cannot be made in the case of an incorrect price having been input into our system or where a dramatic price increase has been encountered by us. &###xA0; So long as the goods are part of the current catalogue then there is no time limit to this unless the product has a use by date. We cannot accept soiled products such as used spray guns. We reserve the right to charge for any necessary packaging/re-packaging. This listing is currently undergoing maintenance, we apologise for any inconvenience caused. The item "Chicago Pneumatic CP7748 1/2 Composite Impact Wrench" is in sale since Wednesday, September 27, 2017. 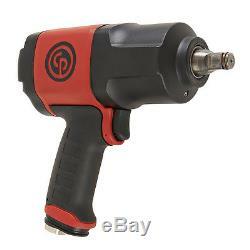 This item is in the category "Vehicle Parts & Accessories\Garage Equipment & Tools\Air Tools\Impact Wrenches". The seller is "spraygunsdirect" and is located in Derby. This item can be shipped worldwide.